If you are searching for a unique musical and visual experience that differs from the now mundane and washed out greyscale of a scene that seems to be prevalent throughout the country, there are few better places to look than the calendar of Insomniac Events. While raves are no longer warehouse parties and PLUR is dead, the music scene is alive and kicking as a new wave of energy-hungry young adults look towards the EDM festival circuit for their dose of bass, lights, and beyond anything else, memories. Beyond Wonderland 2019, this years episode of the Alice in Wonderland themed party, is set to be one of the best yet as Insomniac Events gears up to drop beats with a stacked lineup of international icons as well as up and comers that are killing the soundcloud and spotify charts. With four unique and diverse stages (five if you count the Wide Awake Art Car that graces each Insomniac party) being hosted by the likes of Bassrush, mau5trap, Basscon, Dreamstate, and more, Beyond Wonderland is shaping up to be a doozie. If you have never been to one of the Beyond Wonderland parties, here’s a little pro-tip: go. These events remain one of the most demanded and beloved musical shindigs that Southern California gets to host and continues to be a symbol for the rise of festival season as Beyond is the first massive electronic music event of the year. While this may show my age, the first Beyond Wonderland I got to attend (2011) featured the first ever Porter Robinson set in California, as well as a ton of names like Noisia, Kill The Noise, Showtek (when they actually played hardstyle), Dirtyphonics, and more (I was and obviously still am, a basshead, or what kids today call “headbanger”). While this year will bring similarities to years past, there are always new surprises and Insomniac never holds back. 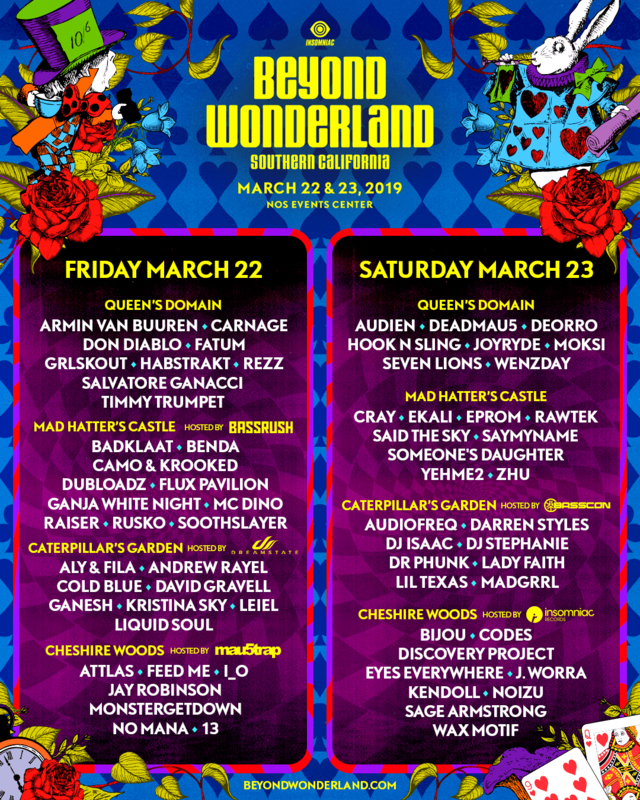 Take yourself down the rabbit hole on March 22nd and 23rd at the NOS Events Center in San Bernardino and get your loony on with thousands of like minded party goers looking to escape to a world of beats, treats, and friendship at Beyond Wonderland.